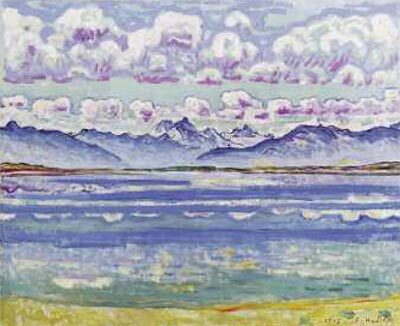 Hodler's symbolist vision of a harmonious unity between mankind and nature, his vision of an all-pervading cosmic unity, is at the heart of this exhibition. The artist strove to show the idea hidden behind the realistic appearance of things and to reveal their deeper reality. He consistently intensified the depiction of reality into a symbolist one, while searching for generally valid expressions of human existence and symbolically portraying emotions. In his paintings, the human figure is often to be seen as part of a greater whole under the open sky in an elemental state of being. 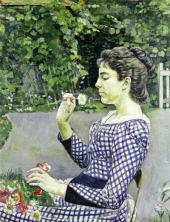 With his very personal style, Hodler made an important contribution to the avant-garde of his time. 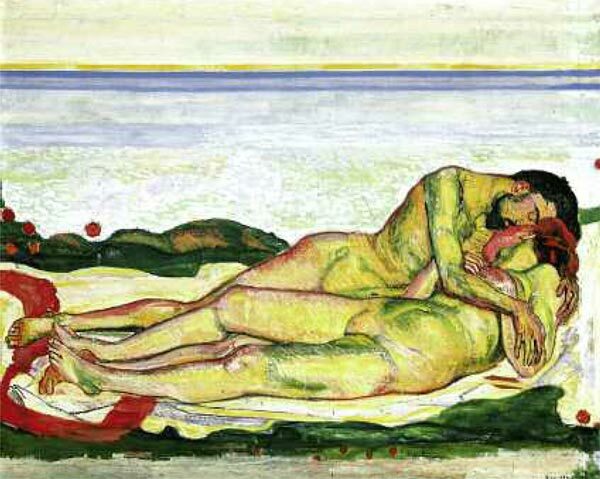 Preoccupied with the fundamental themes of humanity Hodler dealt with basic human themes such as love, death, hope, and belief. From his first steps in realism he searched for general natural laws and regulative structures. 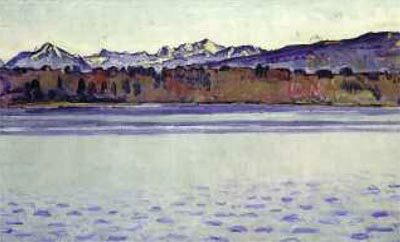 Hodler was convinced that beauty lay in order, symmetry and rhythm; thus he based his compositions on what he called "Parallelism". 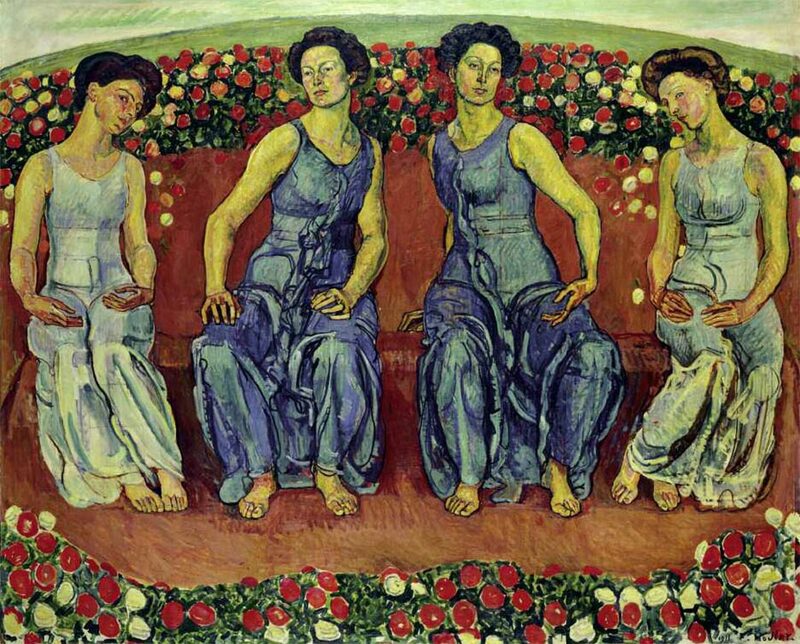 He applied the principles of Parallelism in the composition of many of his works: the repetition of similar figures, reflections, a severely symmetrical construct or a systematic shifting are typical compositional elements in Hodler's works. Under the concept of "Parallelism" he understood all forms of formal repetition in a picture. He was convinced that this created an entirety which would enable one to gain a more profound impression of what was depicted. For him, therefore, Parallelism signified the Idea of Unity between sensation and mental perception, both of which manifest themselves in form and colour. Hodler's name is associated with Symbolism as his goal was never to conceptually fix or directly express an idea but to depict its deeper reality illustratively. 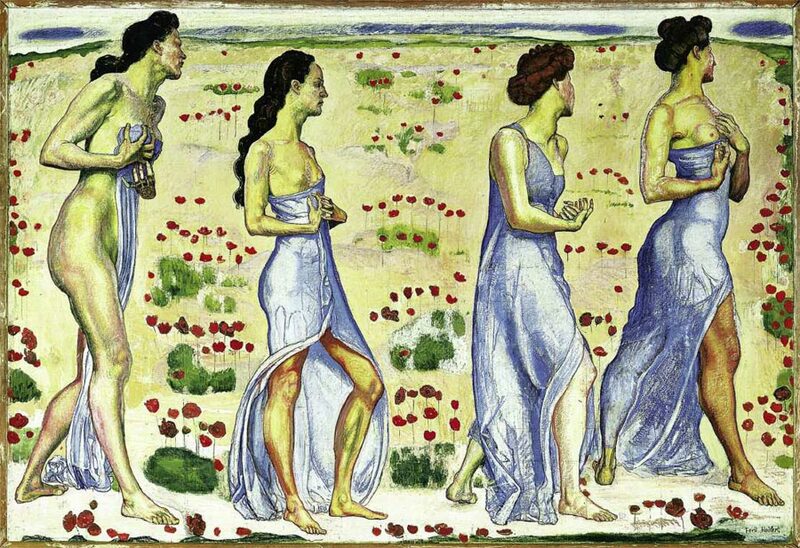 In the 1890s, Hodler created a series of paintings in which he was preoccupied with the fundamental questions of existence and in which he created striking symbols of life and death, belief and hope. For Hodler, the breakthrough to a satisfactory pictorial form for a significant symbolist theme came in 1889-1890 with "The Night", his most powerfully effective composition and the one with which he achieved his first great success outside Switzerland. In the midst of peacefully sleeping figures, one is startled awake, assailed by a black phantom of death. The instant of the sudden attack and the vehement resistance are captured so strikingly that they irrefutably convey the constant threat of death hanging over us all. The portrait-like features of the central figure show the artist's traumatic experience of death which he is now able to depict in a parable of timeless validity. 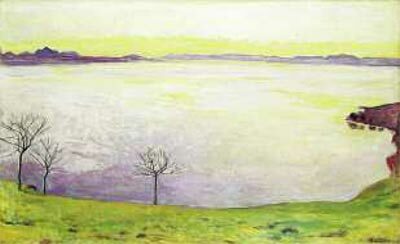 With "The Day", painted between 1899 and 1900, Hodler produced his great counterpart to "Night". He portrayed - with the expressive gestures of five female nudes - the shaking off of sleep and a rapt devotion intensifying to ecstasy in the greeting of the rising sun and the triumph of the cosmic energy of light. In the rhythm of the rising bodies, arranged to reflect each other but yet varied in detail, the individual sensations of one and the same experience shared by the whole world and renewed every morning become apparent. 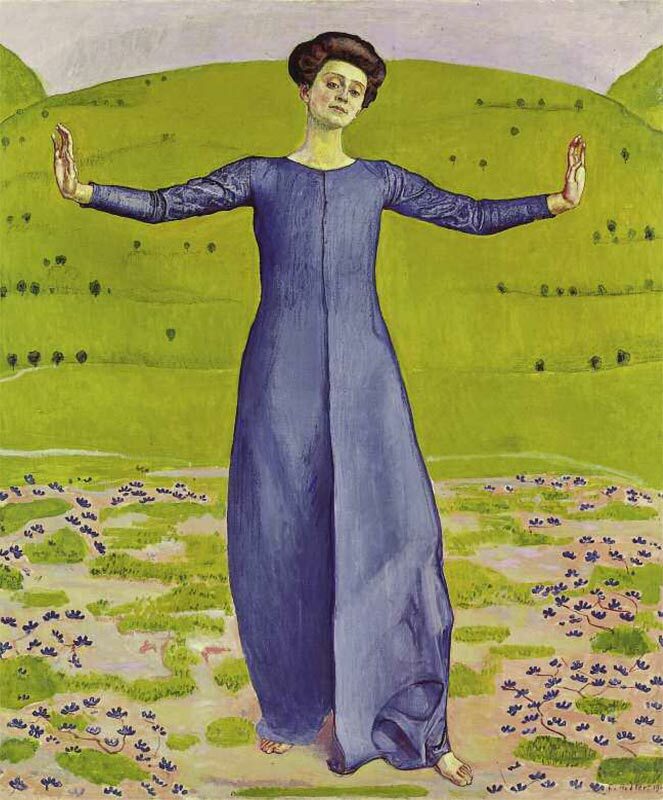 In the spring of 1908, Hodler met the Parisienne Valentine Gode-Darel, who was 20 years younger than the artist, who then posed for him for several figure compositions. Although she was already ill with cancer, she gave birth to their healthy daughter Paulette in October 1913. 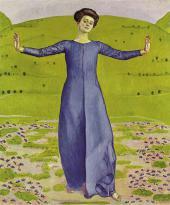 Hodler drew and painted his beloved mistress until her death on January 25 1915. The result was a moving cycle of pictures reflecting the progression of the illness, her dying and death in merciless realism. 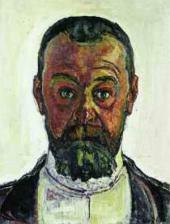 The exhibited figure compositions, landscapes, portraits and self-portraits give an insight into Hodler's creative method and his artistic credo. For the first time, different versions of the outstanding symbolistic figure compositions have been shown together, thus giving a new insight into Hodler's complex development of motifs. The Editorial Board of the Tretyakov Gallery Magazine express their sincere gratitude to the Kunstmuseum Bern, and the curators of the show Katharina Schmidt, Matthias Frehner, with the support of Therese Bhattacharya-Stettler. Oil on canvas. 187 × 230 cm. Oil on canvas. 40.5 × 31.5 cm. Oil on canvas. 140 × 120 cm. Oil on canvas. 145 × 175 cm. Oil on canvas. 88.5 × 69.5 cm.